How Much Income Do Retirees Really Need? Do percentage-based rules of thumb for replacing pre-retirement income say, 80% make sense? Michael Finke weighs in. 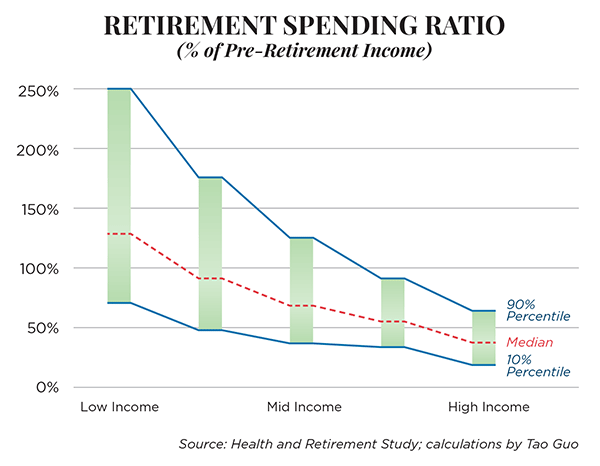 What percentage of pre-retirement income do your clients want to spend in retirement? The so-called income replacement rate concept is often the first step in estimating a retirement savings plan. A 2012 Aon Hewett study suggested that retirees should try to replace 85% of their income during the first year of retirement. Many advisors take an 80% or 85% number for granted. If you earned $100,000 right before retirement, you’ll need an income of $85,000 to avoid cutting back during your golden years. But can one number really be right for all retirees? And does an 80% rule of thumb even make sense? Let’s review the first assumption of the 80% replacement rate. People generally want to spend the same amount after retirement as they did before retirement. They don’t want to experience what economists call a “consumption discontinuity” after they retire, which is a fancy way of saying that they spend less. I think that there are some important reasons why we might use the 80% rule. It’s easy, for one. Just multiply a nice simple fraction by your income. Second, and related to the first, it’s kind of hard to actually figure out how much a household needs in order to match their spending after retirement. The third is that it’s a generally conservative number that encourages workers to save a lot more during their working years. Saving more is good, right? To an economist, this isn’t such an easy call. Every dollar that you save during working years has a tradeoff — it’s a dollar that you could have spent on home improvements, a family vacation, eating out, or a newer car. If you’re giving up a family vacation at age 35 when money is tight in order to buy a vacation at age 75 when you may have a higher income, are you getting the most out of life? Economists following a life-cycle framework note that income is often at a peak right before retirement. In other words, families tend to be earning less in their 30s and 40s than they do in their 50s and 60s. A household that was a utility maximizing robot would smooth spending over all these years to avoid living it up in one life stage while living in poverty in another. Ideally, we’ll want to spend about the same each year before and after retirement. For example, if we made $50,000 (inflation-adjusted) each year between 30 and 50, and $70,000 each year between 50 and 70, a reasonably smooth lifetime income might be, say, $45,000. So we’ll save $5,000 each year early in life, $25,000 each year in middle age, and then continue spending $45,000 a year into retirement. If we peg the replacement rate at 80% of $70,000 then we’ll be spending $56,000 each year after retirement. In other words, we’ll be living better after retirement than we did when we were raising a family in young adulthood. And don’t forget that we’re often chipping away at a mortgage early in life that allows us to enjoy rent-free housing in retirement. But most of us would have a tough time following a life-cycle strategy. If we become professionally successful later in life, we may become accustomed to a higher level of spending that we want to maintain in retirement. Few clients are going to be happy taking a big hit to their standard of living. If they have the resources to hire an advisor, then they want to enjoy themselves in retirement. What does it take to maintain a post-retirement lifestyle? Let’s review the basics. A worker contributes 7.65% of his or her paycheck to Social Security and Medicare (make that 15.3% if you’re self-employed). That’s money that was never even available for spending. And what if we were saving a bunch of money before retirement in order to meet our 80% (or 85%) replacement rate? That’s money we were never spending either. A worker saving 15% of income would then start out by subtracting this 15% and the 7.65% Social Security. Now we’re down to 77%. Of last year’s income. If we were using the economics methods of average lifetime income, we might be closer to 60% or even less. But wait, there’s more. Retirees don’t have work-related commuting expenses; they have a higher standard deduction, plus subsidized Medicare health insurance (although many have subsidized health insurance during working years); and Social Security is taxed at a slightly lower rate. But most importantly, higher-income retirees may be in a much lower tax bracket after they start living off investments and 401(k) assets. Assessing whether the 80% rule could be applied to a broad range of retirees was the focus of a 2014 study by David Blanchett, head of retirement research at Morningstar. Blanchett takes into account Social Security rules, reduced payroll taxes, and funding from a traditional IRA and a Roth. He estimates that a replacement rate that would match pre-retirement net income with post-retirement net income would be in a range of 54% to 87% depending on the amount of “pre-tax expenses” such as qualified savings and Social Security. The importance of Roth income when calculating replacement rates is a point Blanchett emphasizes. “If you have a lot of your income in Roth money, a lot of your income won’t be taxable and that reduces your effective replacement rate,” he says. “Your needed replacement rate is higher if your income is lower, but you’ll be getting a lot more from Social Security.” Higher income folks who are often clients of financial advisors tend to see a lot of the income flowing into things like taxes and savings from their pre-retirement paycheck. What about the life-cycle approach to replacement ratios? Blanchett says that he does “not think it makes sense to use average lifetime earnings” but rather “it makes sense to use average expenditures before retirement.” But this brings up perhaps the most important question: What are retirees actually spending before they retire? If the goal is to maintain a standard of living, isn’t it important to know how much spending they need to replace? 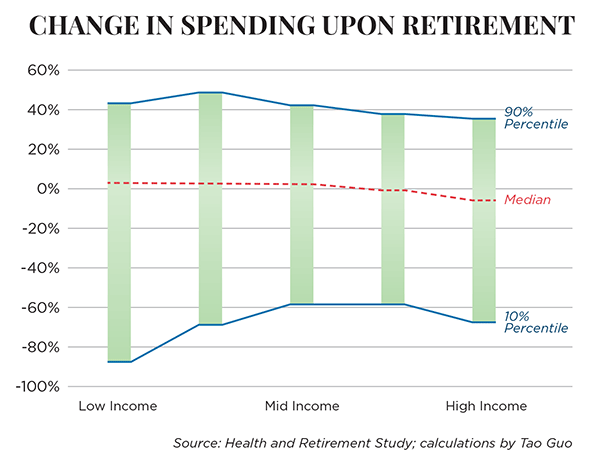 A quick analysis of the same data used by Blanchett shows that the median change in spending in the year after retirement is 1.4% higher than it was in the survey year before retirement, and there are many retirees in the highest income group that spend a lot less after retirement. Spending declines throughout retirement, as Blanchett notes, but perhaps the most important point too often overlooked in this literature is that most Americans don’t spend their take-home income before retirement after they save money in a 401(k) and pay Uncle Sam. In the above examples, we’re assuming that people spend all of their net income during working years. In reality, and particularly for higher income folks, this just isn’t the case. When we plot out median spending as a percentage of gross income among pre-retirees, we see that those in the middle, fourth and especially the fifth quintile of income aren’t spending anywhere close to their income. In fact, the median household in the top income quintile is spending 36% of their gross income each year. Even the 90th percentile spendthrift in the top income quintile is spending just 63%. It may not be surprising then that my colleagues and I find that these same high-income people actually accumulate assets in retirement — they become richer each year instead of spending down wealth. That’s probably because they weren’t spending that much to start with and after receiving Social Security, pensions, rental income, dividends, etc., they’d actually have to spend more than they did before retirement to start chipping away at savings. Many wealthier retirees are even resentful that they have to start pulling money out of a 401(k) at 70½. The only accurate way to determine the right replacement ratio in retirement might just be to throw the concept of replacing a percentage of income out the window. What we really need to do is maintain our standard of living in retirement. This means figuring out what we spend before retirement, how much of that spending we want to maintain, covering unknown risks of long-term care and any bequest needs, and then figuring out how much we need in savings to close the gap. Like a lot of handy rules of thumb, replacement rates are ripe for re-examination. While the 80% rule may have made sense as a quick yardstick, in today’s low interest rate environment it may lead many near-retirees to believe that they haven’t saved anywhere near enough to retire. For many higher-income Americans, the question shouldn’t be how much of your income you want to spend in retirement. It should be how much of your lifestyle do you want to keep. Will Low Investment Returns Wreck Retirement?